The 2013 Summer Oakridge Hummingbird Census has begun. Today through Monday, September 2nd. Hummingbirds at feeder; Photo by B.LaVergne, 08-27-2013. Count the number of hummingbirds of each species you see on your property during these seven days. 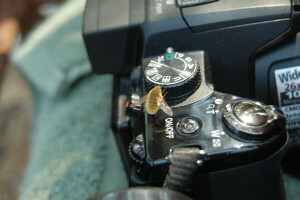 Take pictures, keep track of how many times a day you need to refill your feeders, etc. Send all your information to “Attention: Birding” (in the subject line of your email) at oakridgeranchwma@gmail.com. We’d love to share you pictures with others here on the website. Live life outdoors! Have fun watching these beautiful little birds! We have two feeders and are seeing approximately a dozen Hummingbirds at each feeder. 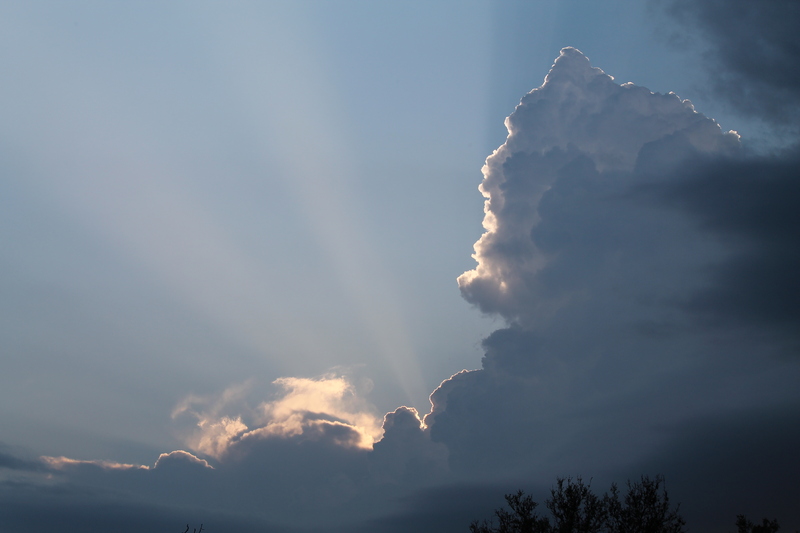 Photo by B.LaVergne, 08-27-2013. “Come to Daddy!” – Nolan Hall. Add your caption to this picture by clicking on “Leave a Reply” and posting your own. We have this beautiful old Farkleberry tree which is about 15′ tall, that as drought tolerant as they are reported to be, I think has finally succumbed to our prolonged dry conditions. The picture here is during “better times”. I sincerely hope it recovers. The native Farkleberry, Sparkleberry Vaccinium arboretum, is another really great addition to our environment. It offers something neat for every season. An understory, deciduous plant, this perennial is mostly found as a large shrub, but as you can see, under the right conditions can grow upwards to 25′ with a spread to match. In the spring it has white flowers that resemble little bells, that ripen to dark blue berries in the fall, along with beautiful red fall foliage. 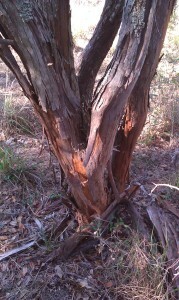 In the winter, the twisted exfoliating bark is striking colors of red and gray. It attracts pollinators, Bobwhite Quail, American Robins and small mammals. Bark & Trunk of the Farkleberry Tree, Photo by D.Burrows, August 2013. Last month’s Ice Cream Social was a huge success. Those who attended, about 60, were delighted with the flavor selection presented: vanilla, banana walnut, margarita, chocolate peppermint, avocado lime, lemon basil, Muscadine, jalapeno flavor, and root beer floats. You had to try them to experience them! Many thanks to Jean Herring for organizing the event and thanks to Lynne Bigelow for being such a gracious host! Our Annual Fall Meeting will be September 21st, 10:00 AM, at Cecil Stevenson’s barn. At this time, we will issue doe permits. We will also have the entry forms for the Colorado County Whitetail Contest. David Mitchem will announce our own Oakridge Whitetail Contest. Annual dues will be collected and membership forms will be available to fill out as we update our records. Hummingbird Census in Oakridge Ranch August 27th through September 2nd, 2013: Please count the number of each hummingbird species you see on your property during this week. Take pictures also! Send all data and pictures to “Attention: Birding” at oakridgeranchwma@gmail.com by September 5th. A recipe for hummingbird food is on the Birding tab on the ORWMA website. Our August Deer Census is currently in progress. The remaining dates are August 24 & 31 at 8:30 PM. This census will determine the amount of doe permits Oakridge Ranch is eligible for. This year our Annual Wounded Warrior Hunt will be December 14th and 15th. Join us as we start preparation for this annual event! Details to follow. We are always excited to hear your comments – – – we are hopeful that the varieties of articles we present interest all landowners in Oakridge Ranch. Please click on “Leave a Reply” to add your caption for the picture below. Have fun! Black & Yellow Argiope; Photo by Nolan Hall, 08-15-2013. 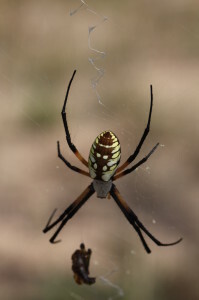 The following link contains excellent information on the Black & Yellow Argiope spider (Argiope aurantia), one of the largest spiders in our area of Texas. These spiders can easily be found here in the wooded areas of Oakridge Ranch, especially in our gardens where the spiders can find plenty of food prey. The Black & Yellow Argiope is a beneficial spider that preys on mosquitoes, moths & other flying insects, especially the mud dauber & other wasps. Do be careful with these spiders as these can sting. Their sting is like that of a bee to most people, but may be worse for those with bee sting allergies or to the very young or older individuals. Without the presence of these beneficial insects, we would be overrun with insects we really don’t want to have around. We hope you click on the link below to learn more about this interesting and “beautiful” arachnoid. I encourage you to move quickly past the ewwww factor, to consider the beneficial Dung beetle, aka scarab beetle or tumblebug. You will find two species here. The dark colored beetle you’ll see is Onthophagus gazelle, introduced to Texas in the 1970s and now well established. The metallic one, “Rainbow scarab” is Phanaeus vindex and is related to the scarabs of ancient Egypt. They measure some 1/2″ to 1″ in length. These guys are kind of fun to watch, as they work their magic on dog droppings, cattle – whatever. Quoting a foremost Texas expert, ecologist Dr. Pat Richardson: “They slurp it, haul it, roll it, fight about it, and bury it…They don’t bite or spit or sting. 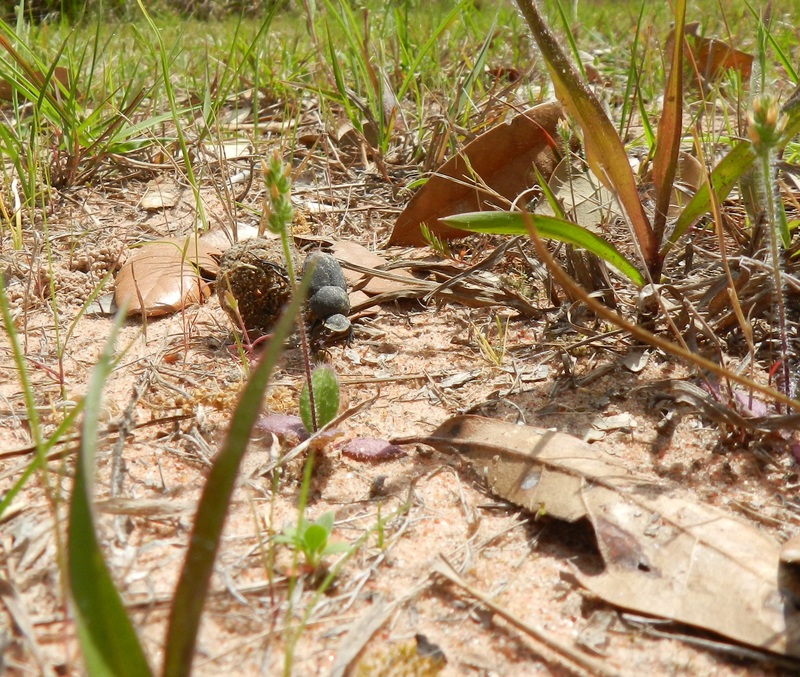 They simple live, eat, sleep and dream dung.” However, there is a good deal to learn about the importance of dung beetles. 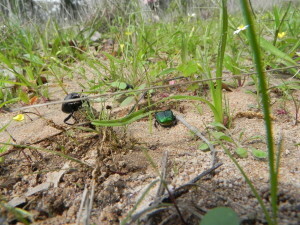 Researchers have discovered that dung beetles “will bury a ton of wet manure per acre per day and remove 90 percent of the surface material… A horse pad can disappear underground in 24 hours, leaving only a soft fluffy layer of undigested plant material.” She always speaks with enthusiasm about the dung beetle. I do not know how the drought is affecting them, but I do know, they are another reason to totally avoid insecticides, to let natural biodiversity handle the job. The healthier the soil is, the better. Pussyfoot, Stinking Prairie-clover Dalea obovata can be found in the Lambert’s front acreage, and around, along Oakridge Road. 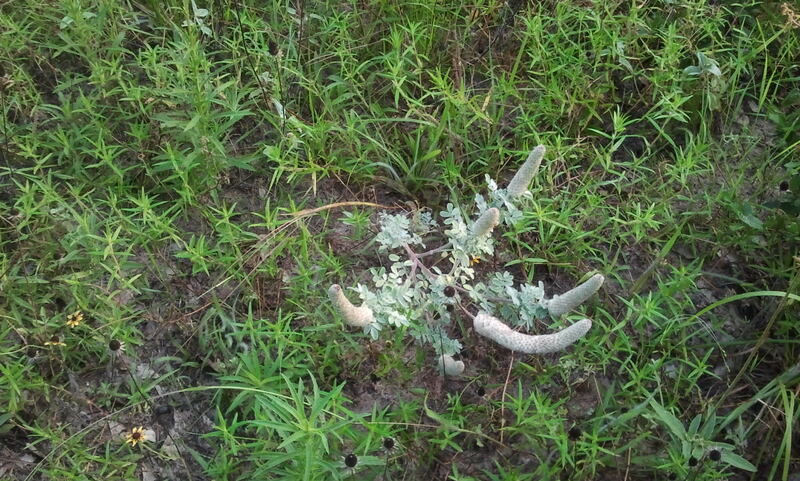 And probably elsewhere because this plant is endemic to Texas and particularly loves the sandy soil and scattered oaks of the ranch. 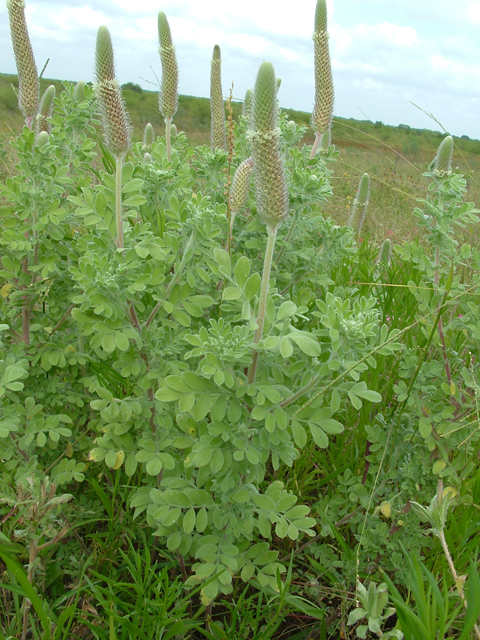 This perennial herb is a member of the pea family. At the ranch it typically flowers in the spring with whitish flowers, going to seed in late summer. Elsewhere, flowering has been recorded from April until October. Plants can reach 1′ to 2′ tall. They are particularly beneficial to bees. Thank you Glenda for the great picture. Now regardless of time of year, you will perhaps be able to see its potential and recognize it a little easier. For a very long time, I have been totally fascinated with bats. We have had some great experiences with bat watching; even gone into an undeveloped Texas cave for guano and stayed to experience the emergence with no one around, standing there, waving our hands above our heads as they flew toward us, missing us every time. It is awe inspiring. Our experiences have been with Mexican Free-tailed bats Tadarida brasiliensis, the most common Texas bat. Probably the species you watch from your porch on summer evenings. They are here from about February and most begin to leave for Mexico now, in August. The 20 million or so Mexican Free-tailed bats of Bracken Cave, the world’s largest known colony, eats a quarter of a million pounds or more of insects nightly, covering thousands of square miles. These amazing creatures emerge each evening, climbing to more than 10,000 feet, and can catch tail winds that can drive them to speeds of over 60 miles per hour to distant feeding grounds. It almost can’t be stated enough how bats are by far the most important controllers of night flying insects, even mosquitos. To my surprise, I have learned that joining the Mexican Free-tailed bat in our skies are 8 additional species: Big Brown bat Eptesicus fuscus, Silver-haired bat Lasionycteris noctivagans, Eastern Red bat Lasiurus borealis, Hoary bat Lasiurus cinereus, Northern yellow bat Lasiurus intermedius, Seminole bat Lasiurus seminolus, Evening bat Nycticeius humeralis and Tri-colored bat Perimyotis subflavus. Did you know: Bats are highly intelligent and even trainable? World-wide, there are over 1000 extremely diverse species? Millions of bats are dying from White-nose Syndrome? Some species hibernate rather than migrate? Some species are vital pollinators? Some feed on fruit or nectar? Not all species roost in caves? There are no blind bats? They do not become entangled in people’s hair? They pose less of a threat to human health than do household pets? Living out in the country may, indeed, expose us more often to snakes than living in the city would. I have decided to do some much delayed research on these valuable members of the Oakridge Ranch environment. I hope I haven’t missed one, but did you know that there are 21 Colorado County snakes species? Only four on this list is poisonous. That four includes the Copperhead, Agkistrodon contortrix, Cottonmouth Agkistrodon piscivorus, Timber Rattlesnake Crotalus horridus and Texas Coralsnake Micrurus tener. Being familiar with their habitat and life cycle should go a long way toward shielding you. Reiterating that being aware and being educated about these beneficial creatures as they make a living on the ranch, perhaps allows a little more co-existence. We must take precautions around our homes. No question. But, the environmental impact of the old adage: “the only good snake is a dead snake”, can be very detrimental and I submit is overdoing it. The citizen scientists among us might want to check out: http://www.herpsoftexas.org/view/snakes and look for Eastern Racer, Red-Bellied Mudsnake, Plains Hog-Nosed, Eastern Hog-Nosed, Prairie Kingsnake, Common Kingsnake, Coachwhip, Plain-Bellied Watersnake, Southern Watersnake, Diamond-Backed Watersnake, Rough Greensnake, Eastern Ratsnake, DeKay’s Brownsnake, Checkered Gartersnake, Western Ribbonsnake, Rough Earthsnake, and Plains Threadsnake – – all common names from this website, with scientific names shown there, along with pictures, descriptions of habitat, etc.